My Odysseus references are all out of order. This one happened sometime during the middle of the voyage, but literary allusions are not bound by time. So there. Odysseus’s fleet landed in Thrinacia, an island where a herd of beautiful cattle were raised. They were tended by Helios, the sun god. But he was busy doing sun god things so he put his daughters in charge. This bit of the story really should be called the Cattle of Phaethusa and Lampetia. They did all the hard work. Though they were hungry, Odysseus warned his men not to eat the cattle because they were grown for the gods. But nothing can stand between a sailor and a juicy hamburger, so the men slaughtered a few cows and had themselves a feast. In retrospect, the men should have portrayed themselves as freedom fighters, fighting for equal rights, opening up fair access to all resources, especially the choice magical beef. Instead, history knows them as a bunch of greedy, impatient louts. The daughters told Helios, but since he was busy doing sun god things, he told Zeus, knowing that Zeus was a hothead. Sure enough, Zeus destroyed Odysseus’s last ship, and they all ended up adrift at sea on loose planks and masts. On the drive up to Oregon today we stopped off at a Denny’s for dinner. T wanted to see what a real American Denny’s was like. The Denny’s in Japan has totally different food. For instance, one of my favorite dishes there is a sashimi rice bowl. At the Denny’s in Yreka (the last California town before entering Oregon), I ordered the Lumberjack Slam, and T ordered the All-American Slam. Mine came with grits (which is just fancy talk for polenta), bacon, sausages, pancakes with a pile of creamed butter on top, an extra thing of creamed butter on the side just in case I wanted to increase my chances of a heart attack, and some kind of bread. You can have white, whole wheat, sourdough, rye, English muffin, or ciabatta with buttered garlic. With the butter shortage in Japan, I ordered the ciabatta, just to stock up, because that creamed butter on the side wasn’t really enough. Then of course, how would you like your eggs? I like mine as an omelette lightly fried in olive oil and garlic folded with whole basil leaf and avocado, but I settled for scrambled. So many choices. Also: free refills of coffee. Miss that. It was pretty good too. In the past, whenever I ate at a diner in a small town like Yreka, little white kids would stare at me, and mustachioed white men would eye me suspiciously from under their caps. I’m sure it was because I was so good-looking. But probably it was because they didn’t see too many people of color. I also had waitresses talk loud and slow to me. Maybe they thought people of Asian descent were genetically predisposed to deafness. I’ll tell you one thing though. I was impressed at how well the waitresses could speak English. In the 1980’s, there were numerous instances of African-Americans and Asian-Americans being refused service, being given atrocious service, forced to pay in advance, or pay more than white customers at Denny’s. There were other uglier incidents of these customers being forcibly removed by security for demanding to be served. 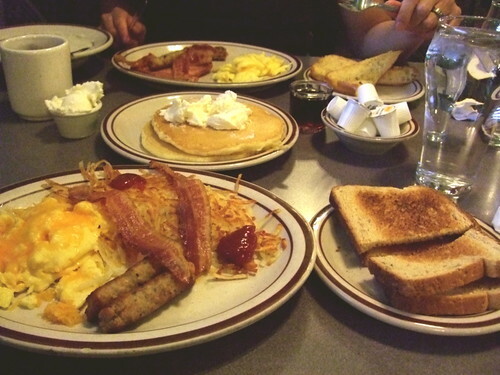 In 1994, a large class-action lawsuit was successfully filed against Denny’s. After that, the company implemented sensitivity training for all its employees. And by 2001, Denny’s was deemed by Fortune Magazine as “the best company for minorities”. So maybe America did evolve a little more in the last decade. Now we all have equal access to more butter and increased risks for heart disease! I was doing some internet searching because I wondered if the odyssey was the etymological source for the term “sacred cows” and I found your site and your thoughtful and hilarious post. You are clever and funny! Thank you.